Up until now I’ve been writing about online methods of website traffic promotion, but there are also lots of things you can do offline too. It’s just a case of doing things to get more eyeballs on your site. Probably the best example of a real master at getting noticed is Ling Valentine of LingsCars.com. She appeared on the UK version of Dragons’ Den (as the show’s called internationally; the US version is called Shark Tank ) and turned down investment from the Dragons. She also uses tanks, trucks and many other attention-grabbing tactics to make her website known. I doubt if there can be many UK webmasters who haven’t heard of Ling. Whilst we can’t all be like her, and many of us probably wouldn’t want to be anyway, there are still plenty of things you could be doing to drive visitors to your site. 1. Get the URL on the road! Make sure you have your URL on all your company vehicles. If you don’t have any of them, then at least stick a bumper sticker with your URL on your own car. Ask your friends to do it too. Depending on where you live, you might also find that taxi drivers are willing to sell you some space, both inside and outside their vehicles. Some bus companies sell advertising space too. Perhaps you can think of more imaginative ways to grab attention. Pedal power? Maybe you could get hold of a cycle rickshaw, or a tandem, or a tricycle. Unusual things always attract people to look. Of course, you need to do this in context. If you are a plumber in Edinburgh, there’s no point in doing it beyond your local area, but if your business is truly global you can keep your eyes peeled for opportunities like this each time you go on a business trip or even on holiday. The list of what you can give away to promote your website is endless – calendars, T-shirts, caps, mugs, keyrings, pens, etc. Guinness are superb at using give-aways to promote themselves. Over the years, I’ve received hats, a green wig, some lovely drinking glasses, packs of cards, and lighters. Take a leaf out of their book and think about what you could give away. My favourite is pens with the URL on the clip. Depending on the purpose of your website, you can use different strategies. Here’s what I do with the pens. I always carry a small supply of them wherever I go and keep my eyes open for opportunities to give them away. Airports, for example, often require people to fill in forms and you’d be amazed at how many people don’t have a pen handy for the purpose. I give them one. If they lose it or leave it behind, then no doubt someone else will come along and pick it up. I also look for pubs with pub quizzes, and ask if they would like a supply of pens to hand out to the quiz participants. They’re usually pleased to have them rather than having to buy their own supplies of pens. I also have friends all over the world so if I meet up with them while they’re on holiday, I ask them to take 50 or 100 pens back to their own country and give them out there. 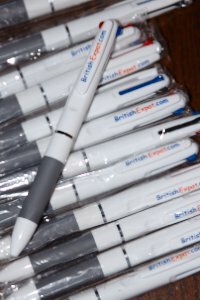 I’ve got pens being given away in loads of countries so far – Australia, Cambodia, Malta to name but a few. And, yes, it is relevant to the website, which is for Brits around the world. Here’s another example of giving things away, but more targeted. 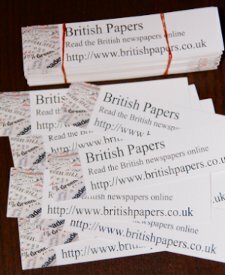 I had bookmarks made for our site about British newspapers, and I ask the owners of second-hand bookshops to give these bookmarks away to their customers. They’re usually happy to oblige. Why only second-hand bookshops? Well, most other bookshops seem to be part of big chains these days and have their own promotional materials to give away to their customers. It doesn’t have to be bookmarks, of course, it’s just that people who are interested in reading newspapers are likely to be interested in books too. If your site was about gardening, you might want to give away packets of seeds. There’s really no limit to what you could be doing to spread the word about your website. Most people reading this won’t be in the league of buying TV adverts, and offers of TV appearances are likely to be rare. I’ve had a couple of offers as a food blogger but I declined. I suspected it was the kind of reality TV in which they hope that the participants will make complete fools of themselves. I can be daft enough sometimes without doing it on national TV. However, it’s quite easy to get yourself on the radio, especially local radio. If there’s something newsworthy in your niche, there’s a good chance that a radio presenter will pick up on the story and be looking for people to interview about it. Make sure you are one of the people who is perceived as being a name in that niche, and chances are, you’ll be the one they call when they want to ask someone questions about the subject. We’re not talking about full-page colour spreads here. However, it’s becoming more and more common to see small ads in various newspapers and magazines with a brief text description and a URL. I haven’t actually tried this myself yet, but I will, and then report back. I thought it might be worth having a go in Private Eye , which we subscribe to. You don’t want to aim for the national newspapers or the big glossies (not yet, anyway). Instead, try to find a more niche publication. There are magazines about almost every subject under the sun, so there’s bound to be somewhere suitable and affordable for you to promote your site. Many local clubs have monthly meetings including guest speakers, whether it’s the Woman’s Institute or the local mountaineering club. If the subject of your site is relevant to them, they may be interested in having you along as a guest speaker. As well as raising your profile within your (hopefully interesting) talk, you can also take the opportunity to combine it with giving away your promotional merchandise, such as pens. Always be looking for chances to kill two birds with one stone. To sum up, if you’re not promoting your website offline as well as online, then you are missing out on a whole lot of potential new traffic and customers. So, what are you waiting for? The main problem with this type of marketing is that it’s very hard to measure the results, especially in terms of ROI, but in my opinion, it’s still worth a shot to spread the word about your website.